As seen in the Opal Express, newsletter of the American Opal Society, 1998. This instruction list presumes a certain amount of initial knowledge, and is not intended to be a beginner's guide. The primary purpose of this guide is to provide more detailed instructions on when to change disks on a flat-lap and when to change to hand-sanding. For a beginner's step-by-step guide to cutting Opal, from the initial process of selecting the opal to the basics of form and shape please refer to Paul B. Downing's book, Opal Cutting Made Easy. Wear safety glasses at all times when machinery is on. Do not reach near motors, belts or pulleys. If the stone slips out of your hand or comes off the dop stick, turn the machine off and wait until it stops turning before you retrieve the stone. use a Flat-Lap machine without the Water Drip. Pay close attention to the amount of water in your reservoir and replace as often as necessary. Do not grind the stone dry! Always hold the stone or the dop stick firmly. The rotation speed of the flat-lap will pull the stone or dop stick out of your hand if held loosely. Do not allow waste water to drain into a sink. It can harden like cement, eventually closing off the pipe. Allow the waste water to accumulate in a bucket, then dispose of it elsewhere. 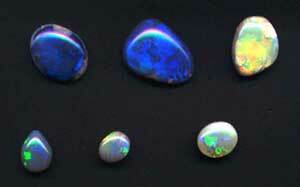 In the example, section 1 would give very little workable opal, while 2 and 3 might produce nice small rounds later on. I would use the 180 Diamond Disc to grind away 1 and trim 2 and 3 with the saw. Only dop to the outline of your shape. On a flat-lap, I like to dop now rather than waiting until the shaping step, as I would when using a wheel. There is much debate in the industry for hot dopping vs. cold dopping. Use whichever method you prefer. For coarse-grinding, use the 180 Mesh Type I Diamond Disc on the flat-lap. Keep the angle of the stone parallel to the disc at all times. To prevent back and neck pains, I find it best to position the flat-lap at chest height. Make sure it is stable. To prevent wrist pains, keep your hand straight with your arm without bending your wrist. Use your other hand to brace the stick while you rotate the stick with your fingers. At this point, no more work should be done on the 180 Diamond Disk. The opal will grind down too quickly if any doming work is done on the Diamond Disk. For fine-grinding on the flat-lap, use the 325 Mesh Brown Disc. Keep a light touch – it isn’t necessary to push the stone down on the disc, just firmly touch the edge on the disc and the rotation will do the grinding for you. Don’t go over your line. Grind just to the edge, where you can still see the line. On the 325 Brown Disc, grind the appropriate degree of bevel for your color-band within the opal. A standard dome starts with a 45° bevel. For thin color-bands, a shallower dome will be required. Grind another bevel higher up on the stone. Using a rocking motion, grind a continuous dome all over the top of the stone. Leave grinding marks in – don't try and smooth them out at this time. They will be removed in a later step. Check for any cracks or fractures that might have developed. Note all visible grind marks. With the 600 Mesh Red Diamond Disc, carefully go over the dome with smooth, constant rocking motions. Dry the stone and inspect it frequently. All obvious grinding marks should be removed with this step. Using the 600 Disc, continue going over the dome until you expose the proper color-band for optimal fire. Be aware of your stone - inspect it frequently under strong light with water on the stone. While there are different layers of fire in a color-band, do not keep grinding down until there is no color left! Using the 1200 Mesh Aqua Diamond Disc, carefully go over the dome with smooth, constant rocking motions in all directions. All visible grinding marks should be removed with this step. Lay a quadrant of silicon carbide sand-paper, 220 grit, on a pamphlet or small magazine. Bracing the backing so that it curves slightly, take your dopped stone and sand in a swirling motion of ellipses, while continuously rotating the dop stick. Wiping the stone clean between passes, use the reflection of the parallel fluorescent light bulbs to scan for flat spots which must be removed. Hold the stone so that you can see a band of reflected light on the surface. Rotate the stone slowly in all directions, watching the band of light. Where the dome is smooth, the band will be continuous. If a flat spot is present, the band will distort. Repeat step 12 with 400 grit sandpaper and then with 600 grit sandpaper. For an extra-fine, quick polish, sand briefly with 1200 grit sandpaper. In addition to inspecting the stone by light reflection, inspect the stone with a 10x viewer for fine detail. If you have a long-distance viewer, scan by light reflection using the 10x viewer for the most accuracy. Do not proceed to this step until ALL scratches or flat spots are removed. Rinse your hands and the dopped stone to remove any dirt or grit. Go back to the flat-lap and put on the White Tech-10 Pad, applying a small amount of the polishing compound. This pad is not used with water. Do not allow the stone to overheat! Continuously check the stone for build-up. Gently but firmly apply the stone to the disc, rotating and rocking it in the same manner used for grinding. Wipe the stone off with a dry cloth and inspect the quality of the polish. Inspect the stone with light reflection. If there are any flat spots, you will need to fine-sand again until you have a perfect dome. Continue polishing until there is no more improvement to the fire and shine of the stone. Wash the dopped stone and dop stick with soap and water. Remove all traces of polish residue before removing dop. The type of dop removal will depend on whether hot dopping or cold dopping was initially used. Use the appropriate method for your needs. Dop the stone on the top side. Grind the back smoothly with the 600 Disc, removing all excess potch material. Be careful of the stone, as the polished surface does not hold the dop as firmly as the rough surface did. Use only light pressure. Make sure the back is even with the dome. Grind a very slight reverse bevel on the girdle. This is necessary to remove the sharp edge of the stone. Hand-sand the back with the 220 grit sandpaper, laying the paper on a flat surface. Also, go over the reverse bevel lightly. As before in Step 16. Soak the stone in fingernail polish remover or alcohol for a few minutes to remove all traces of dopping wax. Rinse off with room temperature water.